Beaded cable ties are inexpensive releasable ties that are easy to install and reuse. The beaded ties are not ties for cinching and there is no tool required. The beads lock and release through keyhole slots and are effective for bundling and reinstallation of wires and cables. Natural ties are preferred for indoor use applications while UV Black is recommended for outdoor applications, providing greater resistance to ultraviolet light. 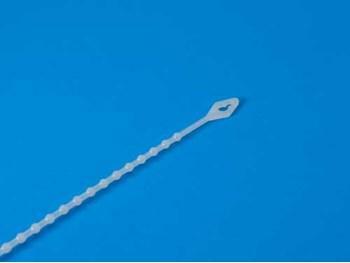 Cable Tie Express stocks the Beaded ties in a variety of lengths from 4”-18” and strengths. Bulk packaging of 1000 ties per bag and smaller packaged quantities are available. Tensile Strength – range from 18 lbs. – 75 lbs.